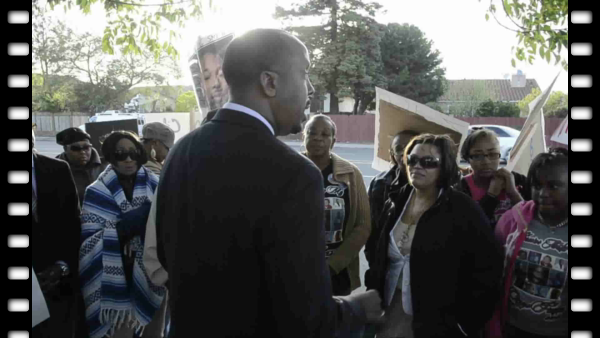 The Family, friends, co-workers, and congregation of Amos G. Smith gathered near the corner of Dyer and Meteor Streets in Union City on April 13 for a candlelight vigil to honor the 26-year-old man who was shot and killed near that location on March 2 by officers with the Union City Police Department. Those present demanded answers from the UCPD, who have released few details of the evening they say started with a routine traffic patrol and ended with the death of Smith. Yolanda Smith, Amos' mother, stood with a sign that read "Union City Police Dept. Murders," and she said in an interview that officers with the Union City Police Department told her very little about what had occurred that night, only that her son pointed a gun at them and that the two officers involved wound up shooting him eight times in the back of the head. According to the UCPD press release of March 3, the two officers involved said Smith fled on foot from his vehicle after being pulled over by them during a "routine" traffic stop. After a "pursuit," officers say Smith pulled a gun and pointed it at them. They claim they then fired their weapons, shooting Smith "several times." Signs held at the vigil for Smith, however, questioned these details, and included messages such as, "Amos Suffered A Cruel Death," "How Do You explain the Life You Claim," "Shoot to Yield, Not to Kill," "We Need Answers," and "Union City PD Oath...'Serve and Protect' Not Murder!!" Many at the vigil wore custom made clothing with screen printed pictures of Amos, and some of the designs played on the "Famous Amos" brand as a way to honor him. "I miss my son, very much. He was a good young man. He worked every day... he was so kind...." Yolanda Smith said, speaking briefly to those at the vigil. Smith said that her son had his Class A driver's license and he was saving money to buy an 18 wheeler truck to start his own business. She recalled that his life was mostly filled with work and church, which is why she was worried when he didn't come home on time the Saturday evening of March 2, the night he was killed. She recalls watching the newstory on television that evening about Union City Police killing someone, and that the "dark colored" car pictured appeared similar to her son's, but it wasn't until rumors started circulating on social media websites during the daytime on Sunday did she first attempt to contact police. After calling and receiving no information whatsoever, Smith physically went down to the the Union City police station on Monday. The authorities on that day would only confirm that the license plate number and physical description of the car involved in the police shooting matched that of her son's, but they would not give her any further information. It wasn't until Tuesday that five officers from the Union City Police Department arrived at Yolanda Smith's home and confirmed it was her son that was killed. Detectives with the department told her the two officers involved shot Amos eight times in the back of the head. "I didn't believe it," said Reverend Macklin of New Sweet Home Church of God in Christ, when asked what his first reaction to Amos' killing was. Yolanda Smith called Macklin, who is the family's pastor, shortly after she found out for certain that Amos was the one killed. Reverend Macklin said he couldn't believe the news because of "who Amos was," and his "lifestyle," explaining that Smith was a "church going young man." Macklin said he had known Amos Smith since, "before he was born," and that Smith was part of New Sweet Home's congregation since birth. Though the family moved to the East Bay, Amos continued to join his mother and grandfather to make the weekly trip across the bay to East Palo Alto for weekend services. The last time Reverend Macklin saw Amos, he was in church, one week prior to his killing. Smith was part of the church's youth department and he played drums for the church choir. Elder Billingsley, another pastor from New Sweet Home Church, also spoke at the vigil saying, "I have some very fond memories of Amos." For a majority of the time Billingsley was at the vigil, the pastor stood with a sign with a large picture of Amos on it with the caption, "Why Murdered." Billingsley recalled going on yearly camping trips with Amos and his grandfather, remembering that, "we had a wonderful time." "It is our prayer, and I want it to be your prayer, that you will join us in asking that Union City Police Department would be very forthcoming and be to be truthful with us, and to give us whatever information that we can have closure concerning our loved ones," Reverend Macklin stated at the vigil. He said they were "pleading" with the authorities to release the information they have, and to sit down with Smith's mother. "Too many of our young black men are losing their lives by the hands of police officers for unnecessary reasons," Macklin asserted. "When I was coming up they would stop you," he said, "but now the police department, they shoot and don't ask questions." Macklin said he "couldn't imagine" what it must have felt like for Yolanda Smith to have waited those three days before discovering the true fate of her son, though ultimately he stated, "we believe in the word of God," and that, "the truth will always prevail." According to a March 5th press release issued by the Union City Police Department, the killing of Amos G. Smith is being investigated independently by both their department and the Alameda County District Attorney’s Office. The law firm of John Burris has been assisting Smith's mother in dealing with the Union City Police, however, attorney Adante D. Porter says that the authorities, "have not been responsive," to questions from the firm or from the family. A response from the Union City Police Department is long overdue, Porter said, and the delay is "unwarranted." "We as a community are entitled, and deserve to know how this young man met his death far too early, far too soon, and this is something that is repeated far too often," Porter told those at the vigil. The killing of Amos G. Smith occurred during a 27 hour period from March 2 to March 3, when three other individuals were killed by police in separate cities and incidents across the Bay Area. Reverand Macklin, Yolanda Smith, Reverand Billingsley, and Adante Porter speak at the vigil. §Union City PD Oath...'Serve and Protect' Not Murder!! §Mr Amos G. Smith Jr., 3-02-2013, Murdered by Union City Police Dept.